WHAT IS CAREA COMPOSITE STONE? Composite materials have advantages over natural materials, without compromising on aesthetics. 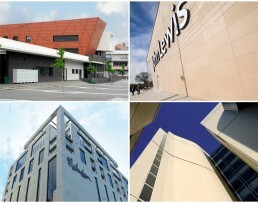 Manufactured to strict tolerances, these panels offer a consistent, durable, non-porous, low maintenance and creative façade option for any commercial building. Comprising of around 95% natural materials – they are highly sustainable, a perfect choice for environmentally conscience construction. CAREA Stone façade panels are lightweight and can be quickly installed to minimise labour costs. Their non-porous composition ensures that they are unaffected by graffiti, making them ideal for buildings in urban areas. Carea Stone Facades, comes with BBA & CWCT Certification, and was one of the first European façade manufacturers to achieve BR135 & Bs8414 accreditation, helping you design out the risk on your projects. Carea Façade panels come with an efficient secret fix installation system as standard, no visible rivets or adhesives required. 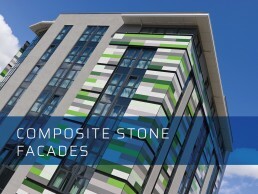 WHY USE CAREA STONE FACADES? RANGES – There are two different products available in this range, all offering specific benefits and advantages.